It may sound too good to be true but InvestingHaven’s research team calculates a long term Ethereum price forecast of $1000, say for 2018 and beyond. Given our extensive background in forecasting markets, from gold to stocks and currencies, we could not resist the challenge to also forecast the price of Ethereum (ETH). After our Ethereum price forecast of $550 for 2017, it was about time to apply the same forecasting method and derive a longer term price target for the price of Ethereum. 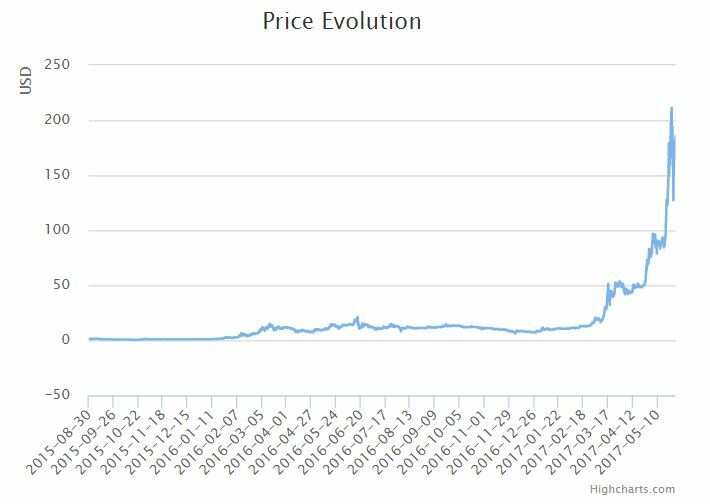 There is one important challenge in trying to forecast the price of Ethereum: there is no useful data available to apply a direct forecasting method. Stated differently, based on the limited set of relevant data we have to rely on an indirect forecasting method. It may sound counterintuitive that there are hardly relevant data points available. There is of course plenty of data in Ethereum space. Take, for instance, Ethstats, a real data hub for Ethereum statistics visualizing ongoing activity on the network, while Etherchain looks at transactions per second, top miners, and so on. All that is interesting information, but not relevant in understanding the real intrinsic value of Ethereum which, essentially, is the basis to forecast a future price. Moreover, in classic markets we are used to take a price chart and look for patterns as a reliable way to derive a price target. Chart analysis is also not very useful in deriving an Ethereum price forecast. The long term chart of Ethereum does not reveal any form of pattern apart from a parabolic rise. This pattern, however, has no visible indications which may suggest how long or how high the rally will go on. Given the challenge outlined above, InvestingHaven’s research team developed a method based on classic supply/demand fundamentals. Similar to any other market Ethereum is subjective to its supply and demand. Our method looks to collect data points which paint a picture of demand, and, in doing so, gives an indication on the intrinsic value of Ethereum. At this moment in time there are 92M coins of Ether available. Supply of Ether will become flat data over time. For now, the supply of Ether keeps on growing, but we will soon reach a point, probably in one or two years, where new coins will be equally created against the number of coins that go out of circulation. That is the intent of the Ether community, so we take that as our working assumption. So for long term forecasting the supply of Ether is not a very important indicator; supply is certainly relevant in the short term but our forecasting timeframe has a long term horizon. A very important indicator is the usage of Ether in decentralized applications. To us, this is the real intrinsic value of Ethereum. Many applications are being launched and developed at this point, and we clearly see a trend in the number of Ethereum based blockchain applications. Here again, we lack specific data, because most of those applications are private in nature, and associated usage stats are not released. Case in point: The Ethereum Alliance, for instance, was set up to create a “spot trade” on the foreign exchange market for global currencies using an adaptation of Ethereum as the settlement layer. The Alliance was created by giant companies like Microsoft, JP Morga, and the likes. Ethereum is playing a major role in applications like predictive analysis, decentralized market places, cross border payment services, digital signature in transactions, digital rights management, crowdfunding, and many more. One of the problems Ether solves is offering Smart Contracts, as explained on Ethereum‘s wiki page. Ether is well on its way to become the standard in decentralized applications among cryptocurrencies, used by many giant corporations. It is hard to calculate the demand and future usage. The finance sector is where Ethereum offers major value. That sector has a huge potential. From that perspective, it is really fair to say that Ethereum’s usage in decentralized blockchain applications will go up 20 to 30 fold over the next 5 to 7 years. That is not an overstatement, but rather an understatement. The other demand aspect is investment driven demand. Right now, Ethereum is closed to the public. One can buy Ether as an investment only with access through a wallet. That really is not mainstream at this point. In April 2017, Grayscale launched The Ethereum Investment Trust (ETC) which is a private fund in Ethereum. 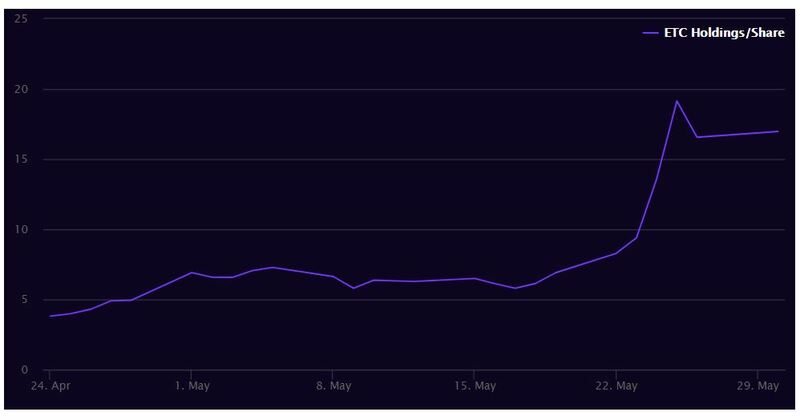 It is a real success, and the chart below illustrates how investors are rushing to invest in Ethereum, with the value of ETC almost quadrupling within a month. However, it is a private fund, so not very accessible to a wider audience. Note that this is one of very few hard data points that is really relevant in forecasting the Ethereum price. It will really become explosive once the huge group of traditional investors and, more so, institutional investors start buying Ether for investment purposes. That group has no positions whatsoever in Ether currently, apart from the private fund mentioned above. Imagine what happens with investment demand once just 0.1% of that group starts buying Ether. Furthermore, there is no Ethereum ETF yet. Such an ETF would open up access to the large group of traditional investors as an ETF needs to hold a minimum of Ether once it launches. The first Bitcoin IRA is a fact, but there is no Ethereum IRA to drive the price of Ethereum higher. Imagine what happens if just 0.01% of retail public starts buying Ether for their IRA. Driven by the hype and increasing demand several online brokers have expanded their offering by providing leveraged cryptocurrencies trading. As the trading volume grows with time, it signals of a wider recognition of Ethereum and other cryptocurrencies as worthy assets to trade and invest in. All in all, we get a clear picture of the enormous long term potential of Ethereum as we examine the supply and demand components. That brings us to the following Ethereum price forecast: supply will be neutral over time, usage demand will go up at least 20-fold, and investment demand will provide incredible leverage. Because of that, it really fair to conclude that an Ethereum price forecast of $1000 will be achieved before 2020, which is a fivefold increase against today’s price level. On September 3d and 4th the price of Ethereum fell sharply and lost some 30% in just 48 hours. Although this is meaningful it was a decrease in line with all other top 10 cryptocurrencies as explained in this article. It is no reason to worry (yet). We still believe Ethereum will outpeform most other cryptocurrencies over time because of the high intrinsic value that this cryptocurrency offers. We stick to our Ethereum price forecast of 1000 USD by 2020. InvestingHaven is the first in the world to offer a Blockchain Investing Research service, subscribe now to get the top 3 to 5 tokens per year and our proprietary risk/reward score for all blockchain stocks trading on public exchanges.